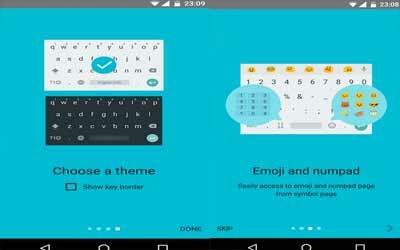 Google Keyboard APK new 5.1.23.127065177 is alternative way to improve the default keyboard on your smartphone. You can find this useful application under tools category. This app allows you to type faster and easier. For information, Google Keyboard is not only reliable, but also responsive. It has plenty features that you will not find on the default keyboard. One of those features is gesture typing. If you need to type long sentence, all you need to do is just sliding your finger on the designated letter. It also features word completion suggestion that allows system to correct the word automatically and predict a certain word. For old people who have trouble seeing the letter on keyboard, they can use the voice-typing feature. All they need to do is taping the microphone icon and dictate the desired word. The best thing about this keyboard is that the smartphone user will be able to use emoji. This emoji feature only works for smartphone with operating system above Android 4.4. Sometimes, when you type a long sentence then change your mind, you might want to delete it. Tapping delete icon will take more time. Instead, you can use gesture delete by sliding your finger to the right. When chatting with your friend, sometimes you need to type symbol such as exclamation mark or question mark. You can long pressing the screen and the application will give you suggested symbol to complete your sentence. As you know, default keyboard uses boring theme. Fortunately, you can change the theme of this futuristic keyboard application as desired. The best thing about it is that it does not include in-app purchases. Therefore, you will be able to use all features without have to pay for it. For those who feel bored with your default keyboard, you can use Google Keyboard for Android instead. Sync your learned words across devices to improve suggestions: To turn on keyboard syncing, go to Settings → Language & input → Google Keyboard → Dictionary → Sync learned words. Gesture cursor control: Slide your finger across the space bar to move the cursor. Gesture delete: Slide left from the delete key to quickly delete multiple words. Symbols hints: Show quick hints on your keys to access symbols with a long press (enable in Google Keyboard Settings → Preferences → Long press for symbols). One handed mode: On large screen phones, pin keyboard to the left or the right of the screen by long pressing on Enter and selecting the thumb icon. Fast symbols: Gesture from the “? !☺” key to temporarily switch to the symbols keyboard and insert a symbol. Fast capitalization: Gesture from the SHIFT key to a character to capitalize it.